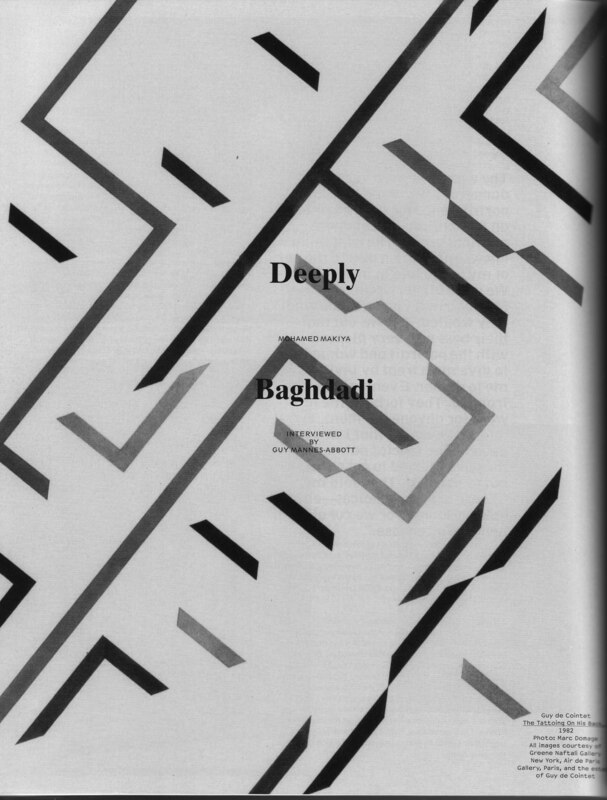 On the occasion of Ala’s first showing of her Plan for a Greater Baghdad (2015) at Delfina Foundation in London along with a new work; Plan for Feminist Greater Baghdad (installation view above; photo Tim Bowditch, courtesy DF and Art Jameel), I should share this text of mine (below in page by page pdfs) since it is not yet re-published in book form. It was commissioned as an independent text and explicitly not as a critique of the work itself. This was not because a serious critical piece on the work would not be good to read or write but because I wanted to extend my e.things essay form and write more broadly about subjects that I had some intimacy with over many years. 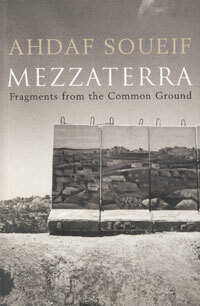 Ahdaf Soueif’s stark truth-telling about Palestine, in the journalism collected in Mezzaterra, saved the day in 2004. It was a bleakly difficult year. The consequences of a series of deaths and accidents were felt thickly while I struggled with the scale and depths of my research on Gujarat, committed to writing a book worthy of a fascinating people/place and my own journeying ‘to the end’. Simultaneously, global indifference to the ongoing dispossession and slaughter of Palestinians combined unique chronicness with acute horror to maddening effect. Ahdaf’s brilliant piece on Palestinian writers, in particular, lit a double pathway. It reminded me why critical journalism can be worthwhile and inspired the discovery of a way to channel outrage into something positive and productive. Surely part of the reason Britain has supported the ongoing ethnic cleansing of Palestine, part of the reason the British government raced into Afghanistan and Iraq in particular is willful ignorance. Ignorance about the people, their history and a culture only perceived mutely at the end of a gun, as a cross on a screen inside an aerial bomber or a cruise missile launcher. I decided to discover as much as I could about Arabic and particularly Palestinian writing in English and to champion it in any way I could. In those 6 years there has been some increased attention beyond 2 or 3 best sellers but, just for instance, why is the assassinated Ghassan Kanafani so hard to get hold of in the UK [on this see here]? More recently, I’ve been learning Arabic and because of the unique way in which it opens up the culture I would advocate a campaign to make a British passport holder fluent in Arabic for every bullet and bomb aimed at an Arabic-speaker in this century, never mind the last. This is to put it as gently -with hard earnt civility and width of appeal- as possible. Six years on settlement activity has flourished and is ongoing, Palestinians [and Lebanese] have been massacred, partly with US dollars and British military equipment, part of Palestine remains under total siege, anyone brave or desperate enough to protest or object is bombed to pieces by a state that is a close ally of the US/UK and EU. At the same time Britain’s fantastically profitable supermarkets are full of reliably cheap Israeli produce. Instead of making any substantive attempt to stay this aberrant hand the British government has sought ways to weaken the application of International jurisdiction as it applies in Britain, so as to encourage links from the perpetrators of what the UN describes as war crimes. When Rudolf Hess fled to Britain from a mortifying regime he was imprisoned for life. Now the British establishment welcomes leaders who are not fleeing but arrive proud and boastful about their very own mortifying regime. When despair is insistent it must be resisted. Resistance of this and all kinds is the propellant along an inexorable path towards justice; the easily achieved human justice of courts and a more open and potent recognition of truth. The rhetorical arc of Never Again peaked and fell into Yet Again during my own lifetime but that doesn’t reduce the universal import or urgency of achieving substantial justice in this particular instance. Free Palestine any which way but minus the cant. ‘Under the Gun A Palestinian Journey’ The Guardian Dec. 2000 here. Pt 2 ‘Our World is Upside Down’ here. ‘Do Something’ The Guardian Letter to Blair April 2002 here. ‘The Waiting Game’ The Guardian Nov 2003 here. 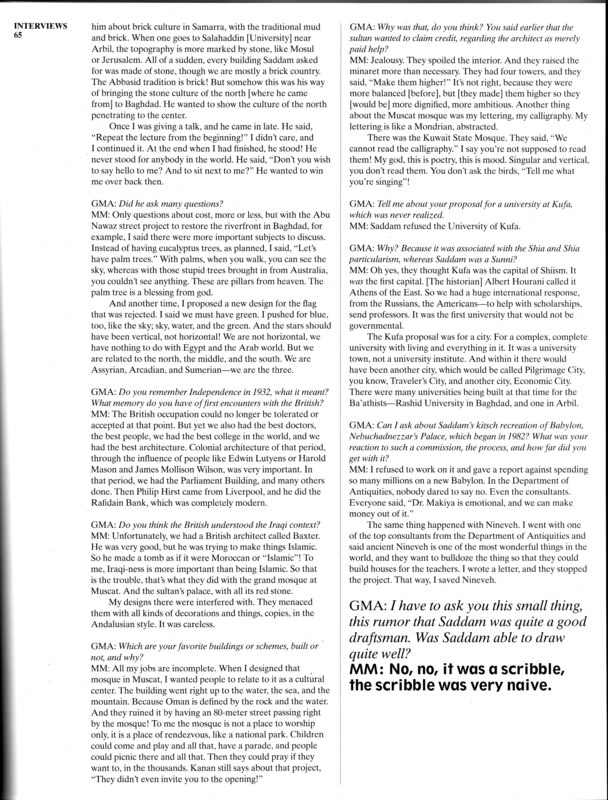 NB In between came ‘Palestinian Writers’ The Guardian Sept 2004; an abridgement of an excellent essay republished in Mezzaterra on the richness of Palestinian writers and writing. It is not online. ‘The Palestinians say; “This is a war of extermination”‘. The Guardian Jan 2009 here. PalFest, the Palestinian Festival of Literature 2010, is ongoing here. Mezzaterra‘s second half, literary pieces from two decades in London, is the surprising bonus. It includes reviews of writers from Jean Genet and Amitav Ghosh to Philip Hensher, along with pieces on al-Jazeera, Islamic “queens” and “the veil”: a term without an Arabic equivalent. Each exhibits Soueif’s demanding exactitude, whereby she will apologise for making “small points” before demonstrating their full import. Words, she proves repeatedly, matter. Souief is transfixed by the Palestinian uprising. She writes, contra Said, of having always felt “essentially in place: Egyptian, Muslim”*. So, writing about Israel’s dispossession of the Palestinians in front of a wilfully diverted world, her combination of centred gravity, minute precision and insistent humanity generates highly clarified truth. The truth makes for bleak reading, as her nightmares materialise in massive new Israeli settlements. “And yet there is still hope,” she writes, even in ravaged Ramallah where Palestinian writers like Liana Badr and Adania Shibli** shape exquisite stories against chronic injustice. The only real hope is for “a viable Palestine”. Although it may require courage, take these marvellous essays to heart. 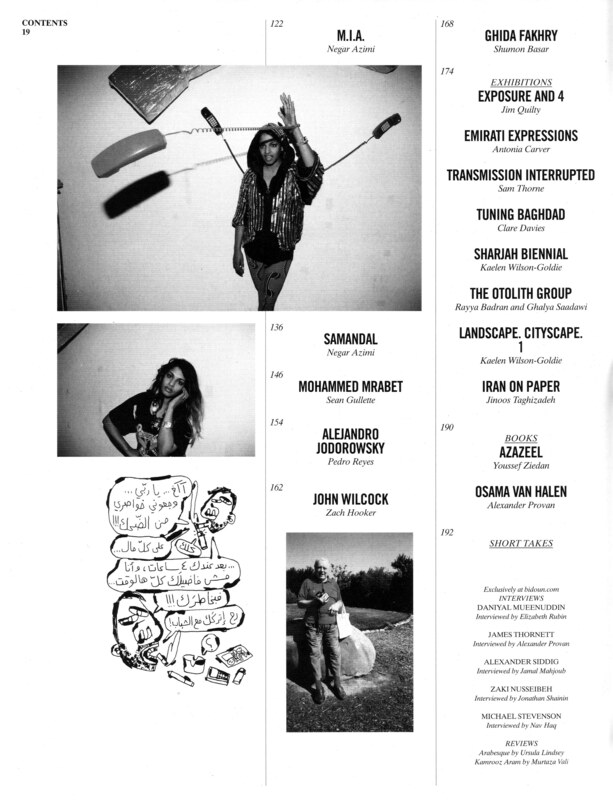 ** Adania is one of the Beirut 39 here and has books forthcoming in English here. Mohamed Makiya is a huge figure. There are partial accounts of him and his work in three books in English, two of them by his son and former colleague Kanan. 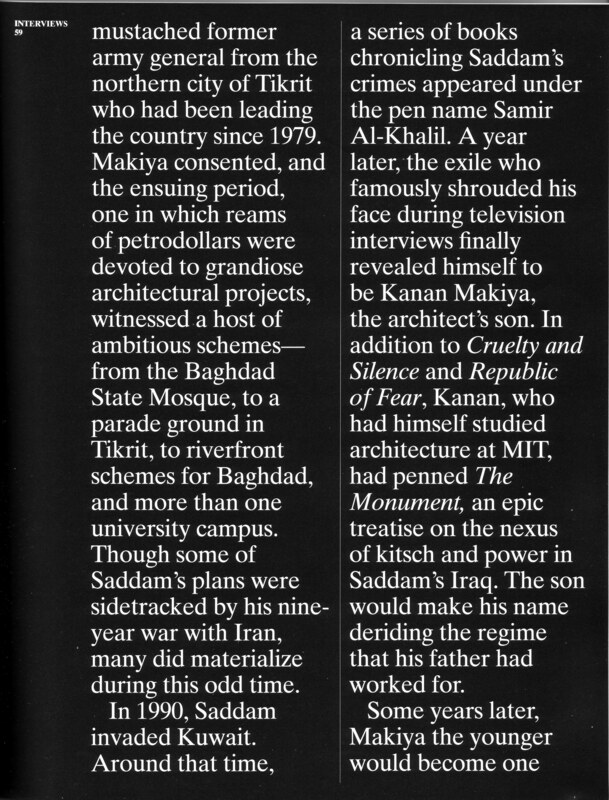 Start with KM’s Post-Islamic Classicism, a Visual Essay published by Saqi, 2001. Then there is a curious and fascinating essay in Lawrence Weschler’s Calamities of Exile; Three Non-fiction Novellas, Chicago UP 1998. Lastly KM’s The Monument; Art and Vulgarity in Saddam Hussein’s Iraq, California UP 1991 is a vital read and provides a variant approach to his father. 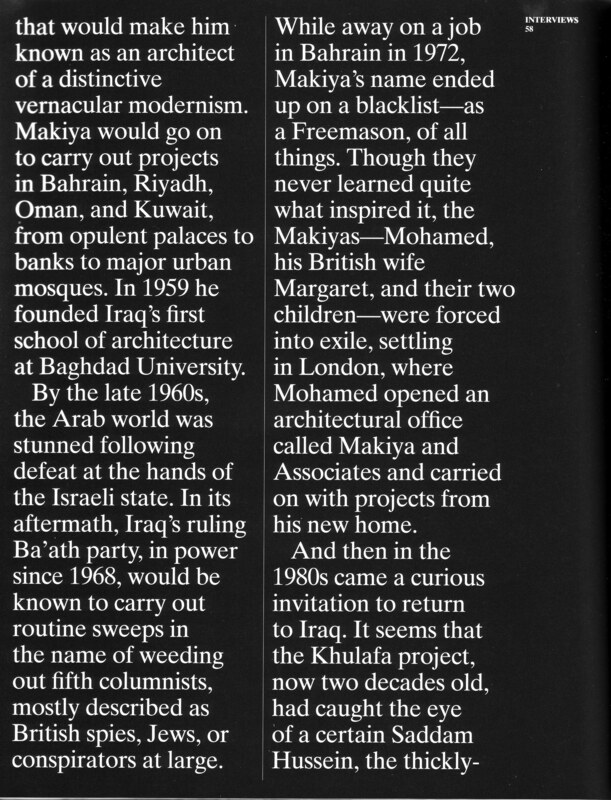 Two other books in Arabic, one on MM’s early years, the other devoted to Baghdad, are helpful -the latter a glimpse at Makiya’s legendary archives on Baghdad and the region. 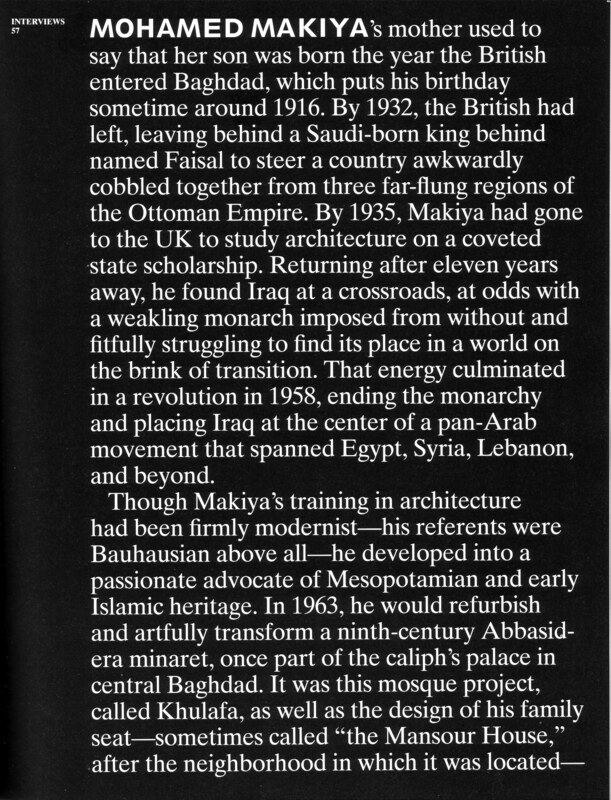 I knew some of his work and its context before I began, notably his brilliant and significant reconfiguration of the Khulafa or Suq al-Ghazal Mosque in central Baghdad and the massive Kuwait State Mosque. Nothing quite prepared me for the complex man, extraordinarily rich work and life that emerged from our conversations. My piece appeared in August and doesn’t resolve this or make up for the absence of a full monograph but it does present a rather different portrait than anything else in print. 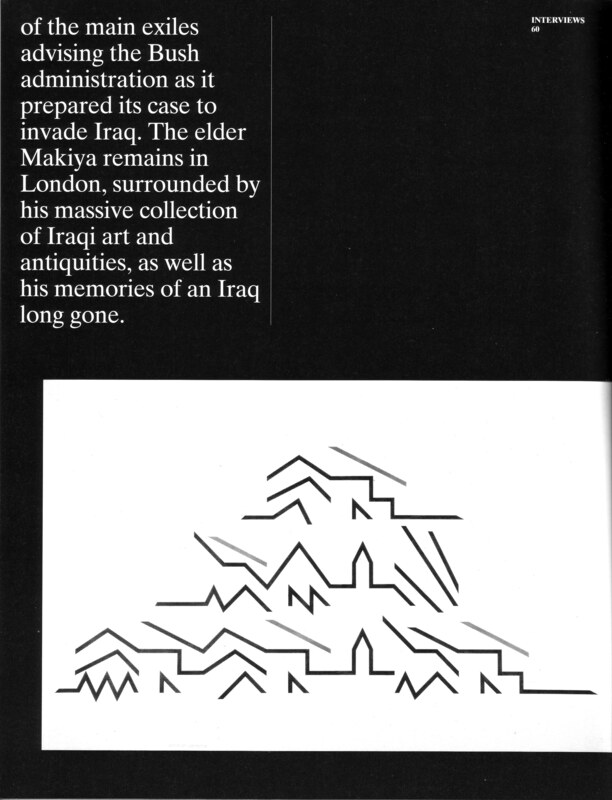 Makiya’s life is part of the unwritten 20th Century, his work a monument to it -as well as many previous ones. 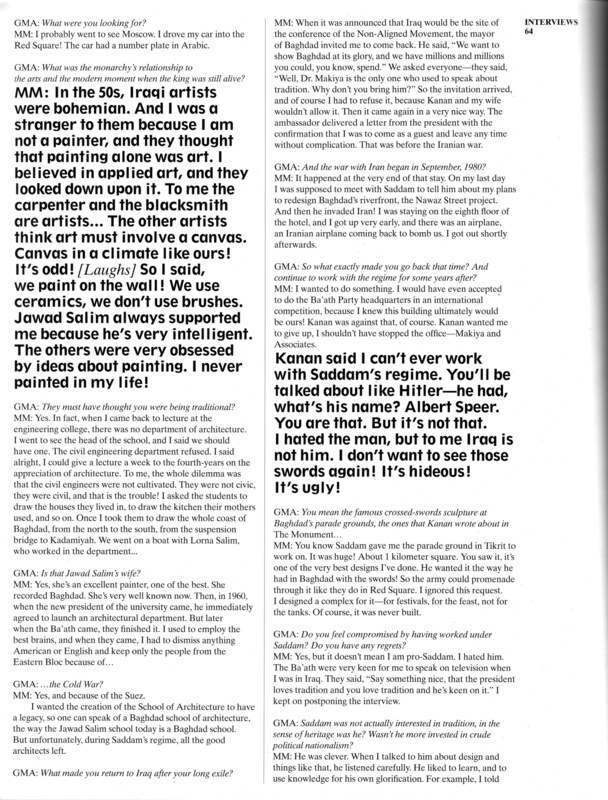 I hope our conversation in Bidoun might provoke an attempt to show and tell the story of his work and life in full. 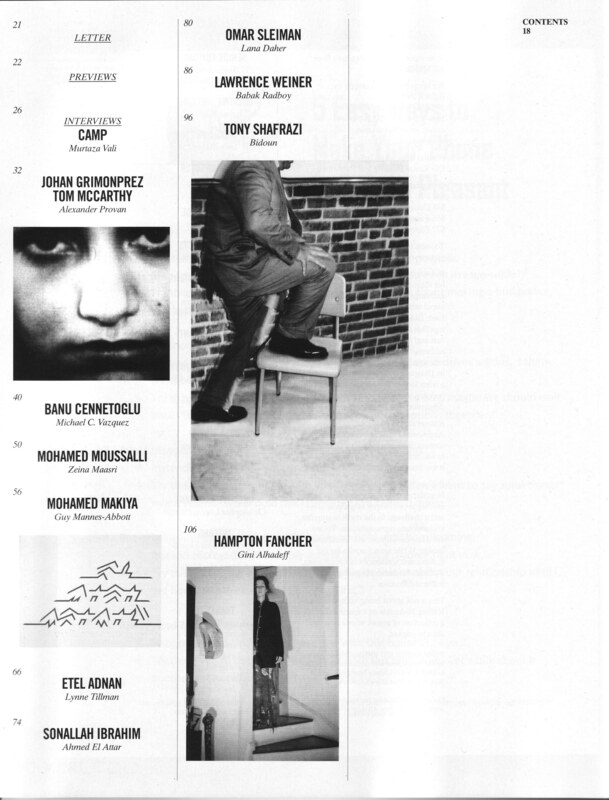 Meanwhile I’m posting some scans, including of Bidoun’s Contents page because it has so much in it that I really think you should buy a copy and/or subscribe.